If you had dressed the likes of Michelle Obama, Lady Gaga, Debbie Harry and countless other celebrities, you’d surely want to shout it from the rooftops. But for fashion designers and environmental consultants Vin and Omi (they go by just their first names), it’s not about who wears their clothes, but what their clothes are made out of, that is really worthy of attention. For the past two decades, the duo have worked tirelessly to weave the connection between recycling channels and textiles production and develop a range of breathable and workable fabrics made from recycled materials. Currently, they boast a catalogue of 12 recycled fabrics made from a variety of sources, from chestnuts turned into ‘leather’, to rPET silk made from discarded bottles found dumped in rivers. Their self-titled fashion house brand, VIN + OMI, was set up in 2004, following over 20 years of experimentation and research into developing new eco materials, a far cry from the luxuries the fashion world demands. But the pair have never quite followed the crowd. Vin and Omi met at a Spice Girls tour after-party nearly 20 years ago. Vin was working on a series of ventures, including directing public art projects and sculpting, but had become tired with lobbying numerous councils for meagre pots of funding. Meanwhile, Omi was working as a photographer on the Spice Girls tour but was “growing tired of being on this side of the camera”. Both at a cross roads, the pair developed a ‘crazy idea’ to create a new form of latex, one which was breathable and moveable but, more importantly, sustainable. A positive, if not admirable, start, but there was one slight hiccup. Neither of them had ever studied fashion. After taking a few classes at a free sewing and pattern workshop, their creative talent was picked up by their teacher, which snowballed into creating a fashion show just a few weeks later. Since the original funding, the pair have worked around the globe to create and develop new materials, design for major fashion labels and work as eco consultants for a range of companies, both inside and outside the fashion circus. Promising a sustainable, closed-loop solution to clothing is an impressive feat, but to make the clothing you need a reliable stream of raw material. To supply this, the brand works with community projects to source the raw material for its rPET fabric. For example, it works with the Riverkeeper project in New York, championed by the designers’ close friend Debbie Harry, which aims to remove litter from the Hudson River. Plastic is collected from the river and sent to a nearby reprocessor, where it is turned into plastic granules. The granules then become the source for the fabric, which is made into garments that are donated to Riverkeeper volunteers, who can then sell them on to help keep the anti-litter project running. When it comes to the brand’s labelled clothing, the principles of the circular model remain the same. Omi adds: “Projects we’ve done in Asia stay there, projects we’ve done in New York stay there. We work in London twice a year over three months, so we isolate projects in that time scale. Fashion is known for its boldness, creativity and influence. It is an institution which shapes and weaves the very fibre of how we live, yet for years any environmental considerations have been incongruous with the industry’s expansion. This has led to a growth in what is now known as ‘fast fashion’, whereby consumers buy more and more clothes at a cheap price to keep up with the latest trends, giving little to no regard as to where their pre-loved noughties sequin top and flared jeans may end up. After years of developing the materials, things slowly began to change for the pair. Omi continues: “During the recession, the whole arts market crashed, including fashion. People started to think sustainable and that’s when we started to bubble up again. With plenty of fashion brands, both on the high street and designer labels, now claiming to source sustainable textiles that are made ethically, the new problem is deciphering what the terms mean. Omi adds: “People are no longer brand-loyal. Because of social media, people want to know where and how the products were made. When brands start working with sustainability concepts, it’s almost a fad. 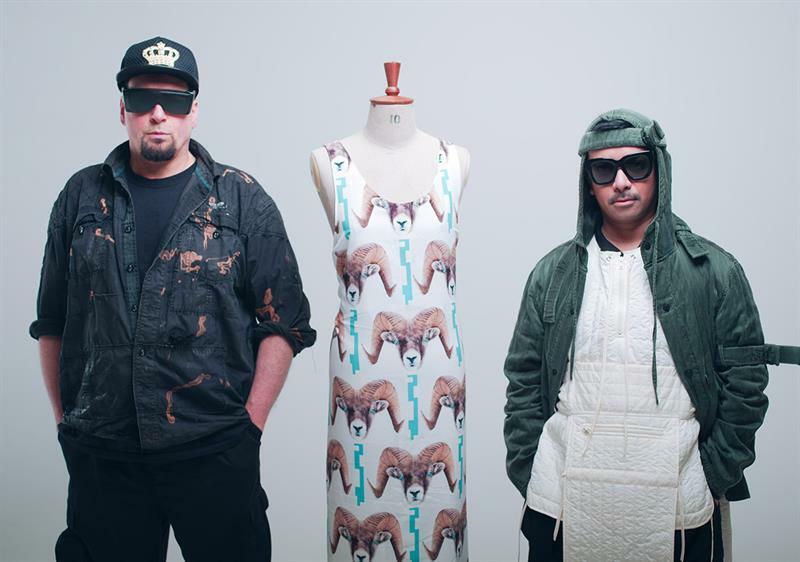 VIN + OMI takes its sustainability and producer responsibility ethos one step further by offering to buy back its clothes from its consumers after they have finished using them, which are then reused and upcycled into new clothing. The scheme has been so successful they are now planning an eco-store in London which will work to bring this unique closed-loop solution to fruition. Whatever the reasons behind it, eco-fashion is well and truly on trend, and VIN + OMI is deservingly relishing the new-found media attention and popularity this has led to. They are now enjoying some of the largest shows outside of the circus and had nearly 2,000 people show up to their last event in September, where Debbie Harry modelled the collection. The designers began to attract the attention of not the fashion press, but mainstream media, which in turn made the fashion world take a closer look at what they were doing. So, is there a sense of annoyance that other brands are simply jumping on board? The work the pair are doing is admirable, but it’s difficult not to be sceptical about the price tag. If you want to be truly sustainable and eco-friendly, it looks like you’re going to have to pay big money for it. Instead, the brand sees itself as aspirational and demonstrates that sustainability is a workable and achievable goal. VIN + OMI is a symbol of what the industry has long known: waste is a resource. As for the fashion world, it’s got a long way to go before it can call itself sustainable, but brands such as VIN + OMI prove it is heading in the right direction.